The classic game that inspired Westwood's Command & Conquer can be played for free in your browser. When most of us think of Dune, we probably remember Frank Herbert's science-fiction books or the Hollywood adaptation they inspired. For many gamers from the early 90s, however, Westwood Studios' Dune 2: The Building of a Dynasty was the classic that defined RTS gameplay and set the stage for Command & Conquer, Warcraft, and Starcraft. Now today's gamers have a chance to see what all the fuss was about, as Dune II has been faithfully recreated in Java and can be played for free on internet browsers worldwide. In Dune II, players step into the boots of a commander for House Atreides, Harkonnen, or Ordos seeking to control the valuable spice trade of Arrakis. With the funds obtained from spice harvesting operations, players can construct units to defend their territory or attack enemy bases. Being the Dune universe, players also have to worry about buildings deteriorating under oppressive weather conditions, and deadly sandworms that can swallow units and vehicles whole. Constructing on rock is the only defense against these creatures, but you can be assured that maintaining your operations will occasionally require you to stray from safety. Dune II popularized most RTS conventions still used today, including base-construction, resource gathering, and faction-specific weaponry. 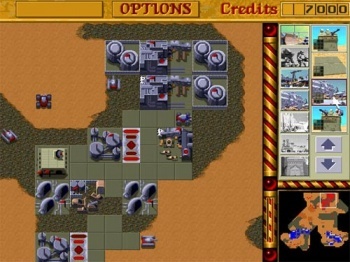 The game was not only successful, it went on to directly influence Westwood's Command & Conquer series and was named one of Time Magazine's top 100 videogames. Previously available for DOS, Amiga, and Sega Genesis, the Java version is an open-source alternative that gamers and gaming historians alike can explore to their heart's content. Be warned: while the game has been recreated faithfully, the classic interface isn't user-friendly compared to modern RTS games. You'll probably want to spend some time with the in-game adviser, or Mentat, before jumping in and constructing new units. Still, as a gaming classic and important part of gaming history, it's great to see Dune II on our computers once again.